The Japanese never ceases to impress people and if you thought that their teppanyaki-style cooking was great, then prepare to be royally inspired even more with the robatayaki way of grilling food! Translated to literally mean “fireside-cooking,” robatayaki is not to be confused with any mecha-inspired anime and/or otherwise mecha film franchise that Hollywood likes to bank on, but rather this is a traditional Japanese cooking method that creates delicious cuisines. Apparently when you incorporate the term “yaki” into another Japanese word, then it instantaneously becomes a palatable meal! Words such as teppanyaki, yakiniku, teriyaki, yakitori, monjayaki, okonomiyaki and a whole lot of other yakis bear a striking ressemblance to robatayaki and it is for a good reason. But in this blog topic we will mostly be talking about the robata grill which makes the robatayaki meals. What is a Robata Grill? The robata grill originated in Japan during the feudal times of the Shoguns and Samurai clans; however, the grill was not as important as the cooking style is – robatayaki. robatayaki dishes and thus the robata grill was born. In ancient times the Japanese cooked their robatayaki meals in the irori, because aside from it keeps them warm they also enjoy cooking, eating and socializing around it. Today’s modern robata grills are multifunctional cooking instruments that allows you to cook/grill multiple recipes at the same time. Robata grills uses white oak “bincho,” or more accurately called Kishu binchotan a compressed hard-wood charcoal that looks like a black cylinder. This type of charcoal produces the right kind of heat and preserves the taste of whatever food you’ll cook on top of the robata grill. There are also no control knobs in robata grills that allows you to control the temperature like in other grills, instead the layout of the grills is setup in a way that there are different levels of grill grates where you can place the food on top of. Raw meat is placed at the bottom grill gate to receive the searing temperatures directly from the coals and then you place the food on the higher grill grates until you reach the top grate where you only need to saute the meat/food. Depending on the kind of food/recipe you’re cooking you can transfer them from the top grate after a few minutes of sauting. So in essence you control how the heat affects the food by placing and replacing the food at the different layers on the robata grill in order to cook them. It’s quite the challenge, but with enough time to practice robatayaki-style of cooking, you should be able to master it. How does the Robata Grill Differ from the Teppanyaki Grill, the Hibachi Grill, the Yakitori Grill and other Grills that seem to Serve Similar Functions? The teppanyaki iron griddle when compared to the robata grill is actually not a grill, but just a flat square or rectangular chrome/stainless steel surface where the chef mostly stir-fry things, although they can technically grill meat, vegetables and other food. Meanwhile, the hibachi grill is a small cylindrical or cube-like baked clay or melted diatomaceous earth that was originally built as a heating device in ancient Japanese homes. Later on people used it for grilling seafood and other recipes that was perfect for quick grilling in a small grilling equipment. The yakitori grill on the other hand was specifically made to cook yakitori meat (skewered meat like Mongolian BBQ style). There is also your normal American charcoal grills and they are vastly different from the robata grill. With the robata grill the heat source (the smoldering Kishu binchotan charcoals) cannot be adjusted and remains constant all throughout your cooking and grilling. You do robatayaki-style cooking/grilling by adjusting the height on which the food/meat is placed on top of the grill. Raw food recipes/meats are placed closer to the heat source to cook them evenly, then the chef moves them higher on the multiple layers of grill grates to lessen the amount of heat that they receive. There aren’t a lot of companies that manufactures and sells robata grills let alone those that make a high quality one; however, the 10 brands below are trusted name in the grilling equipent industry. 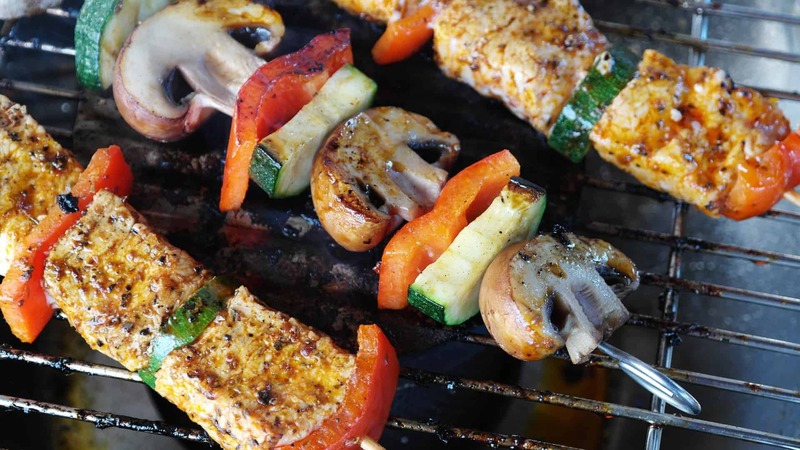 If you are keen on owning a robata grill, then you may want to try preparing these recipes and to see if you are skilled enough to please yourself and your guests. Setup the robata grill, pour the binchotan charcoal in the fuel box below and light it up until the binchotan smolders into glowing pieces of charcoal lumps. Do not use lighter fluid or any liquid fuel when lighting the binchotan up. First you’ll need to prepare the ingredients for the Alfonsino. To make the brining liquid, you’ll need to mix the vinegar, salt and sugar into a large bowl with 2/3 of the volume filled with water (roughly 3-4 cups of water). Prepare a shallow plate and place the fish with the skin facing upwards. Pour brining liquid into the plate that’s enough to submerge the flesh, but will keep the skin dry. Brine the fish for 30 minutes, then transfer it into a clean dry plate and refrigerate for later use. Beat the eggwhites until it becomes foamy and then refrigerate for later use. Place the rice crackers on a dinner plate and set aside. Chop the mushroom in a criss-cross pattern and cut it around the bottom half of the stem also in half lengthwise until you’ll make 20 tiny cubed pieces. Place the frying pan over the stove and set the temperature to medium-high and start heating the oil and butter. Toss in the mushrooms and saute for 1-2 minutes until the outside of it becomes soft, then transfer it into a clean plate and let cool. Remove any dried out outer layers of the spring onions and chop it into tiny pieces, then set aside for later use. This time mix all the ingredients for the aji vinegar in a small bowl and stir thoroughly. You should have more than enough of it to cook all your food. Do the same with the ingredients for the kamkoku sambal sauce and set it aside for later use. Making the truffle poke sauce requires you to mix the kamkoku sambal and aji vinegar in the blender, and then gradually adding the truffle oil until the whole mix thickens into a sauce. After this happens, transfer the sauce into a small bowl and stir thoroughly while tossing in the coriander and lime juice, then set aside for later use. Combine the oil, soy sauce and vinegar in a spray bottle in order to make the balsamic spray. Set it aside for later use. Impale the fish with 4 skewers across its width to keep stable while grilling. Put it at the lowest grill grates of the robata grill with its skin facing the charcoal briquettes for 3 – 5 minutes, so it will get direct heat from the binchotan charcoal. Grill for 15 – 20 minutes more and poke the fish meat with a toothpick every 5 minutes or so to release the fat. Get a brush and use it to coat the skin of the fish with the egg whites that you previously whisked, then dip the fish skin into the rice crackers until you’ve coated them completely. Put the fish back into the robata grill, but this time place it on the second level grill grates to reduce the heat it is being exposed to and make the skin side face downwards to the heat source. Spray the fish skin with light balsamic spray and then spray the binchotan charcoal also in order to infuse the charcoal smoke with the vinegar mix to add flavor to the fish. Cover the fish-skin with a metal bowl and keep grilling it until the rice crackers that has coated it becomes crispy. Turn the opposite side until the fish is cooked at medium-rare. Grill the mushrooms as well and spray them with the balsamic spray (lightly), then cover with a metal bowl or an upsidedown frying pan and grill it until it softens. This time use the brush again in order to coat the spring onions with olive oil. Spray again with the balsamic spray and cook it until it becomes tender. Place the vegetables on the third level grill grates as it does not need too much heat when it is grilled and it is often grilled with low, but consistent temperature. Now the alfonsino robatayaki is ready to serve! Slice the fish into 4 strips lengthwise and place it on a serving plate. Chop the spring onions diagonally to add aesthetics to the food and arrange it on top of each slice. Arrange the mushrooms as well on both sides of the fish slice and drizzle them with the truffle poke sauce as well as grate the lime zest and sprinkle all over them. Yamasa brand soy sauce enhances the taste of the sauce. Choose this soy sauce if it’s available in your area. You can get the aji amarillo paste from Latin American grocers on the web as it is a native in Peru. Even though sambal oelek is an Indoesian chilli, shrimp and fish paste you can buy a bottle of it at Amazon. Truffle oil is easy to find whether online or in your local grocery. Put the whole oregano sprigs, garlic, salt, lemon juice and olive oil in a serving bowl and mix them thoroughly. Grill the squid on the robata grill placing it on the lowest grill grates to get the maximum amount of heat from the binchotan charcoal, then make sure to char each side by letting it sit on the coals for about 60 seconds per side. Once done, remove from the grill and chop the squid in to a quarter of an inch rings (including the tendrils). Toss the chopped squid into the lemon sauce and drizzle freshly ground pepper over it, then serve right away. Marinade the fish with the 2 teaspoons of peanut oil and sprinkle it with sesame seeds. Pour dashi powder into a mixing bowl with 1/2 cup of warm water, then combine the rest of the ingredients with the dashi liquid and stir thoroughly (sugar, red chili flakes, soy sauce and mirin). Set aside for later use. Heat up the saucepan over the robata grill and fry the fish for about 3-4 minutes browning each side evenly. Once it’s done, then transfer the fish onto a clean plate and let sit to cool. Pour the liquid dashi mix into the saucepan and bring to boil (make sure that you only use 3 – 4 quarts of the liquid dashi mix). Place the saucepan on the next level grill grates of the robata grill to reduce heat and let the liquid mix simmer, then add the fish back to the saucepan. Put a lid on the saucepan and let it simmer for another 4 minutes or so, then flip the halibut and cook for some 4 minutes or more. Transfer the halibut onto a clean plate along with the sauce and allow the heat to dissipate for about 5 minutes while it cooks the sauce and it becomes thick and glazy. Stir-fry the vegetables and add them on top of the glazed halibut and serve it immediately.